4 Bedroom Semi Detached House For Sale in Letchworth Garden City for Offers in excess of £400,000. 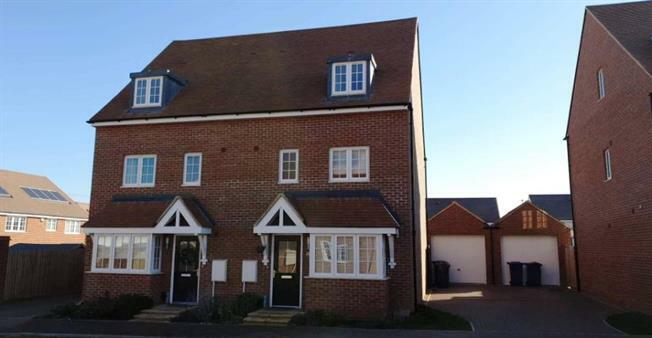 A four bedroom semi-detached town house built in 2017 located on Blackwood Avenue in Letchworth Garden City. This family home benefits from spacious accommodation over three floors and benefits from a driveway and garage. On the ground floor the property comprises: entrance hall way, kitchen with fitted appliances, lounge/ dining room with French doors onto the rear garden and downstairs WC. The first floor comprises: three well propertied bedrooms, family bathroom and stairs leading to the second floor. The second floor comprises a large master bedroom with en-suite. The property further benefits from a rear garden mainly laid to lawn with side access into the garage. Letchworth Garden City is renowned its lively atmosphere and historical charm, this is created by its host of popular shops, restaurants, bars and local leisure facilities along with its many attractions including the Broadway Cinema and The Settlement. Letchworth is also conveniently positioned for access into London, Cambridge and Peterborough via both direct rail link and the A1(m). This modern property is a must view to appreciate this size and proximity to Letchworth town centre.